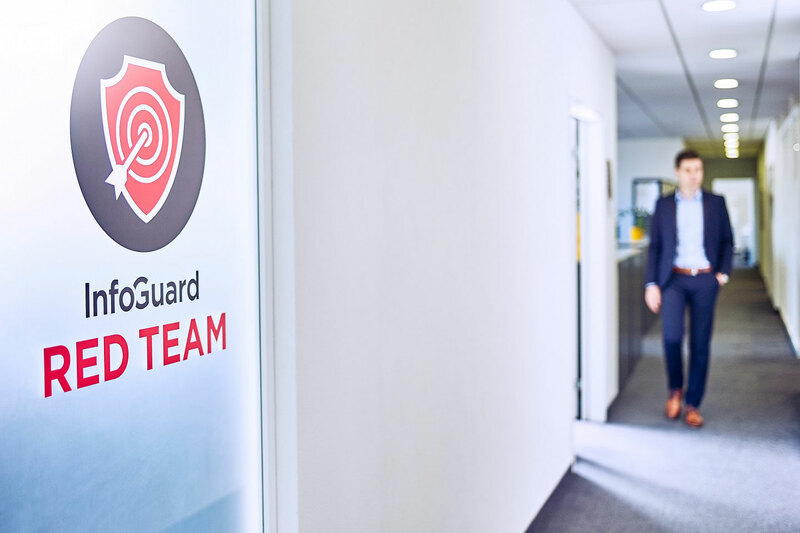 InfoGuard offers targeted security examinations to verify the quality of your security processes, IT infrastructure and employees. This provides an optimal basis for the long-term improvement of your information security and helps to identify risks at an early stage and then evaluate and eliminate them. Our independent audit of your information security highlights the organisational, technical and personnel shortcomings in your company and proposes meaningful measures for improvements. With our detailed plan of action, you receive the foundation for the long-term strengthening of your information security. You also receive recommendations for technical and organisational measures as well as suggestions for building awareness among employees and how to train them. The GDPR recommends reviewing data sensitive applications and critical infrastructures for security risks regularly and testing the effectiveness of the implemented security mechanisms. Our GDPR Web Audit detects precisely such security gaps and helps you comply with the GDPR recommendation. Cloud services have become an integral part of today’s everyday business life. Out of necessity however, employees often use services that have not even been approved by the company. If sensitive data reaches the cloud during this process, this can have serious consequences. With our Cloud Access Audit, we identify the services being used by your employees and analyse the risk associated with them. Our penetration tests provide a reliable assessment about the security status while considering all the factors, which could influence security: applications, systems, networks and users. In order to analyse these decisive factors in detail we offer a selection of tests. The result is an individual penetration test, which takes full account of the specific threats posed. Whether your infrastructure is protected against external or internal attacks will come to light in a penetration test conducted by our security experts. In conducting a social engineering audit we examine the security behaviour of your employees. Our social engineers attempt by personal contact to your employees steal confidential information by exploiting the trust, good faith and helpfulness or excessive demand and uncertainty of the employees. Depending on the test objective and target group, we use different methods and types of social engineering attack, ranging from direct contact, either by telephone or in person, to electronic channels, such as email, chat or social network platforms, up to postal contact with the target. Where required, we also add the selective handing over of manipulated USB storage media, the systematic data analysis over the Internet, or the evaluation of log files and system information to our attack repertoire. With our vulnerability management, you have an efficient opportunity to identify, analyse and evaluate possible IT weak points. A vulnerability scan supplies essential knowledge for the evaluation of the current risk situation and the effectiveness of measures, which have already been taken. The VulnWatcher runs periodic automated checks on your IT systems (switch, firewall, server, clients, etc.) to detect and solve weak points and missing patches. A ticketing system monitors any detected weaknesses, including risk assessment, along with information for remedying them. Proactive checks of your ICT infrastructure reveal changes in the systems and detect not only weak points from manufacturers but also incorrectly configured systems. If the system detects weaknesses having a level of potential risk you defined, the system sends an e-mail alarm and/or text alarm automatically to the system managers. More than half of all breaches involve web applications - yet less than 10% of organizations ensure all critical applications are reviewed for security before and during production. Clearly, organizations need a way to replace fragmented, manual penetration testing with ongoing, automated scanning so they can protect their global application infrastructures. Our scalable cloud-based platform secures all your applications across the Software Development Lifecycle (SDLC) - from code development to pre-production testing and production. Industrial control systems (ICS) and critical infrastructures are frequently referred to together as SCADA and are found in the energy sector, in production systems, in critical infrastructures and in industrial networks and industry 4.0. Their impaired function or failure can have serious consequences. Our security audit will prevent production downtime due to external attackers. The systematic ICS & SCADA audit is a thorough, technical and conceptual security audit of the ICS and SCADA systems and the related components. How fit is your company against hacking attacks? Undergo a realistic cyberattack and see what could happen with your company!